Holidays House Villamaria is situated on the branch of the ancient Via Appia, behind a splendid century-old pine forest bordered by the Mediterranean Sea, in the town of Castel Volturno. Immersed in a private green park with a separate access, has been completely renovated in the spring of 2008, furnished with elegant and modern taste. The rooms are spacious and welcoming and are equipped with air conditioning and all comforts for a pleasant and relaxing stay. It's surrounded by extensive gardens, meadows and areas for grilling and outdoor dining on board pool, and is therefore ideal for families with children and to spend their holidays in complete relax. The garage for the housing of the car has a laundry and a kitchenette attached; the swimming pool, with solarium and hot shower, enable you find refreshment on hot summer days and allow oneself a beneficial tanning in complete privacy. The sandy beach is equipped with restaurant, swimming pool and children's entertainment, is distant about 1 Km easily attainable on foot or by bicycle. For lovers of nature in the pine forest you can make jogging and hiking with mountain biking, while for those who wish to engage in sporting activities a few steps you will find tennis grounds, the most largest golf course in Campania and facilities for riding. Located less than 30 minutes drive from Naples, Caserta and the Airport of Capodichino, Villamaria enjoys a unique location for those wishing to combine a stay of leisure to visits the places of art. 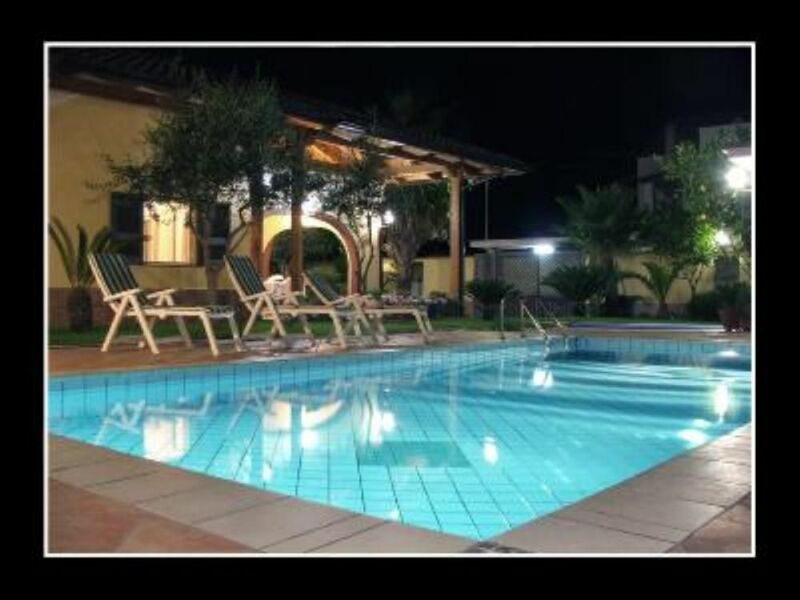 Villa Maria is an excellent choise for a vacantion close to Napoli (approximately 30 minutes by car). The villa.s yard is the most beatiful one we.ve ever seen so far, during our trips. It is also a very good choice for families with children (we were 4 adults with 3 children we had a wonderful time. we stay 14 days and it wasn.t enough:))) ). (Caserta, Capua, Pozzuoli, Baia,Amalfi,Pompei) it would be a good ideea to rent a car. Many thanks, once again, to the Ambrosio family for a wonderful holiday. Lovely people, nice, helpful, and with great respect for the property. It will always be a pleasure to have our guests to Villamaria! When we came to Villa Maria we were very surprised that house in fact more better than on a pictures. It was very pleasure that owners up to our visit left us local delicacies - mozzarella, prosciutto, wine. We were a little hungry from the road so the treats were very useful and very tasty. In this house our company (6 adults) staying during one week and every day we have good rest and relax. This home really has a good energy! We recommend Villa Maria for everyone! Also I want to advise that not far from a house there is a supermarket Conad, where you can buy everything you need. It is very good that on the territory of the house there is a barbecue! The sea is not very far from a house but 10-15 min. on foot. Also you can visit Naples on a bus, which go near a house every 30 min. The way to Naples on this bus takes an hour and come to metro station - Campi Flegrei. We are happy that met owner Massimo, who very help us to have great vacation and had a rest exactly in Villa Maria!!! Ragazzi simpaticissimi e molto educati. La villa è stata lasciata in condizioni perfette, sarà sempre un piacere averli ospiti in futuro. The villa was perfect for our needs, clean, tidy and well equipped. The outdoor area was lovely with well cared for gardens, dining area BBQ and pool. There was 7 of us in our party (4 adults, 3 children) and we all loved our stay. The pool is great, the pictures don't do it justice and we were surprised to find that the deep end was at least 6 foot deep. We felt safe and it was very private. A hire car is a must as there isn't much in the surrounding area but we used the villa as a base and visited Vesuvius, Pompeii, Naples, Monti Casino, Rome and more. The owners were helpful and welcoming and we would love to come back. Famiglia simpatica, educata e con grande rispetto per la proprietà. Villamaria sarà sempre disponibile per voi in futuro! Perfect vacation for big falimy! "Perfect vacation for big family. Charmig villa and owners. ZGood swimming pool. Protected area. good place for sigthseengs - Napoli 30 km. 1 km far from the beach but swiming pool is quite enough after visiting Capri or Pompei or Designer Outlet. Huge supermarket is just in 10 minutes of walk. Small - 4. There was my wife and two kids 3 and 5 years old with me but actualy villa has sleeping places for 8 persons so it is perfect for big family or 8 friends. "Lovely villa with fantastic gardens & pool. Owners gave us a very warm welcome & property very clean & well equipped - even automatic outdoor lights & insect killers! A quiet, restful oasis yet with easy access to motorway & Naples, Pompeii etc." "The villa, pool and garden were excellent quality, luxury accomodation. Very clean and well-equipped and in a private, peaceful cul-de-sac. We had some lovely day trips and we were glad we had a hire car because the local area was disappointing, lots of rubbish and poverty. However, local shopkeepers were very helpful and prices were cheap.The owners of the villa were very helpful and provided us with anything we needed." take the motorway A1 Milano-Napoli, take the exit for SS 7 Bis Variante.